THE GLITTER BALL RETURNS FOR 2018! New Year's Eve is an event looked forward to for months. Intricate planning goes into every component from the outfit, to who you’ll strategically stand next to when the clock strikes midnight, but all too often it’s forgotten about the next day. This year, it’s time to have a New Year's Eve worth remembering (even it if just through the Instagram posts). 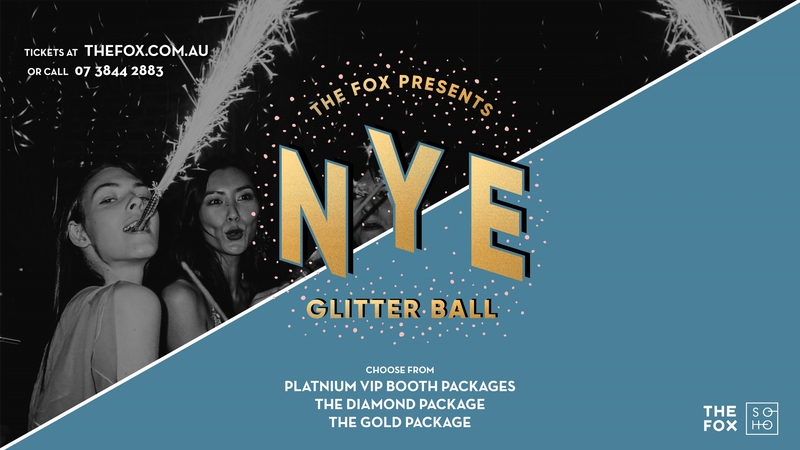 The Glitter Ball is a sky high celebration of excess and gratification… easily one of the most exclusive parties of the year with Brisbane’s best DJ line up all set to a firework filled backdrop! Toast to the New Year in style with a first-class ticket to the Fox Hotel’s Glitter Ball. Includes 5 hours of bottle service of Veuve Clicquot Champagne, Glenmorangie Whiskey and Belvedere Vodka + an array of our premium spirits + Asahi Super Dry, Peroni Nastro Azzurro, Bertie Cider, Rufus + Rogers Rose and selected CBCo. tap beers! On arrival you will be treated to a seafood platter, and then sit down to enjoy 5hrs of luxury canapés, shucked oysters and handmade sliders! Your private booth comfortably seats up to 10 people and will include a private waitress to make sure your night is one of true excess and luxury. EMAIL FUNCTIONS@THEFOX.COM.AU to secure your private booth - only 4 available! A diamond package guarantees you the opportunity to spend NYE living it up in luxury. This NYE package includes 5-hours of gourmet food and premium beverages. Indulge in oysters while you enjoy Veuve Clicquot Champagne, Glenmorangie Whiskey and Belvedere Vodka. Your VIP pass will provide you with exclusive access to Brisbane’s best rooftop bar and the best seats in the house for the spectacular firework display in our DIAMOND VIP SECTION! Includes 5hrs of ALL TAP BEERS & CIDERS + VEUVE CLICQUOT YELLOW LABEL + PREMIUM SPIRITS (including Glenmorangie Whisky + Belvedere Vodka) plus shucked oyster’s on arrival, access to our slider bar & 5hrs of premium roaming canapés & substantials! Secure yourself a golden ticket to Brisbane’s best New Year’s Eve party. The Gold Package gives you access to 5 hours of premium food, free flowing beverages, DJs for entertainment as well as a stunning view of the Brisbane skyline as it is set alight with the midnight fireworks extravaganza.